Mobile dust collectors are suitable for the scattered dust extractions. 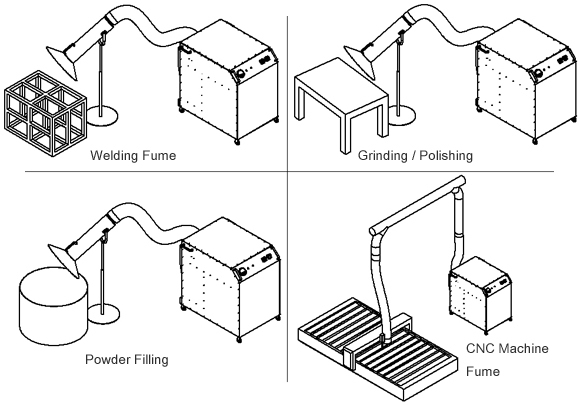 They can filter many types of dusts from various processing. The unit is one-piece structure, built with high efficient filter cartridges, filter cleaning system and extraction arms. Due to the compact structure and the casters under the bottom, the collector can move to working points conveniently. A multi-purpose mobile cartridge dust collector, suitable for scattered working positions and intermittent dust collections. Widest applications with powerful extraction; Not only for welding fume, but also for large dust collections for cutting, grinding, powder filling, weighing, packing and others. Installed with large size filter cartridges. Filter efficiency more than 99%. For manual clean, no need to take out the cartridge filters from units. Standard support for extraction hose with unlimited length；Optional extraction arm, 2m~4m long. Completed with fan starter, pulse clean starter and pressure gauge to monitor the filter cartridges.